...great stock positions that you have selected. Most of them are very qualified long-term dividend growers. I wish you all the best for your asset allocation. Thank you Dividend Yield! I am hoping to keep my portfolio around 90% in the qualified dividend realm. That gives me 10% to play around with BDC's REIT's etc. Thank you for creating such a useful site. I actually have you bookmarked. Your site is an excellent reference with great articles that make it very easy to research the different tiers of dividend growth stocks. Keep up the good work and thanks again for stopping in! 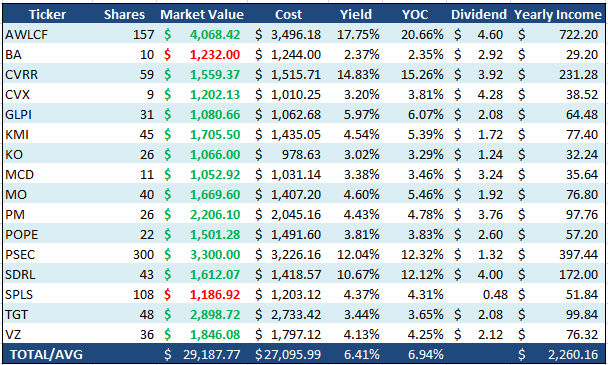 That SDRL dividend yield is pretty juicy. I am adding that to my watch list. Would you mind sharing what got you to pull the trigger on that one? I think the market had an overreaction to fears of reduced offshore drilling. While SDRL is heavily influenced by the price of oil at any given time we have not seen a corresponding decrease in this price. Contract day rates are going up for SDRL and they own the youngest fleet of drilling rigs in the industry which sets them up for years to come (as long as the contracts keep flowing). Be wary that this is a risky play and I am not sure that the market has come to a bottom yet for Seadrill. I remain bullish on this industry and will likely make a few more offshore driller purchases in the near future. I am in no way a financial adviser of any kind. Any and all investment ideas found within this blog should be viewed as possible and probable investment disasters and thus considered for entertainment only.